For more than three decades the Nunavik Research Centre (NRC) in Kuujjuaq, Quebec (which falls under the direction of the Makivik Corporation, the official body that legally represents and serves the needs of Inuit communities in Quebec under the James Bay and Northern Quebec Agreement) has been using traditional ecological knowledge (TEK) collected from the Inuit living in Nunavik over the last 30 years in conducting research aimed at helping the indigenous population living in Quebec. Adam Lewis, Geomatics Manager at the Nunavik Research Centre, is currently heading a monitoring programme that will make use of traditional ecological knowledge and scientific data. The monitoring programme, which is discussed in greater detail a Polar View conglomerate got involved in the project and agreed to provide us with satellite imagery, it allowed us to use satellite data that was previously out-of-reach with respect to our available budget, as well as helped us develop a monitoring protocol for the data we would gather. Why did you choose to look at Arctic charr in particular? Ice conditions affect many species in Nunavik, including polar bears, seals, and Arctic charr; however, the Inuit in Nunavik rely heavily on Arctic charr for subsistence, and the health of this particular fish population is a good indicator of how the ecosystem is doing. Will TEK data be cross-checked with scientific data? This project is quite unique in that we will use the traditional ecological knowledge to cross-check our scientific observations and measurements. The project is distinct in that usually when traditional ecological knowledge is used in conjunction with scientific data, the "science" forms the main basis of the observations, while TEK is used merely as an extra reference. In our project, however, we're doing the reverse. We're using our TEK observations and historical accounts to help us determine how to classify the information we're getting from the satellite imagery Polar View is helping us collect, for example. The long observational history of TEK can be quite useful in looking at a satellite image. If we see an anomaly on a certain section of river that's difficult to classify by scientific methods, we can then look at TEK data for that section of river and determine what has been happening in that area - and in many cases give a history of what's happened in that area over time. For example TEK data records may show that a particular section of river in question has never frozen over completely, so if it does freeze over at some point, then we know that it is an anomaly for as far back as our TEK data goes. It also goes without saying that the TEK database includes ground observations of certain areas, which allows us to validate data on ice classification and thickness derived from satellite radar images. It's still quite difficult to look at a radar image and determine the kind of ice there is and its thickness, so TEK data and in-situ measurements from local hunters can be invaluable for validating satellite observations. Does the TEK data you're collecting either validate or conflict with other scientific data you're collecting? It's important to remember that both methods - collecting TEK data and scientific data - have their limitations. Some researchers make it clear that each method of collecting data is its own body of knowledge and shouldn't necessarily be compared with other methods. However we at the NRC are not only trying to incorporate our TEK with science, but we're also comparing data from the two approaches in order to determine where potential conflicts may lie and reasons for this potential conflict. What kind of adaptation strategies might be adopted at the end of this monitoring programme and how might the data collection contribute to creating better adaptive strategies? That is the purpose of this monitoring programme after all. One important aspect of this project is that it's making use of both remote sensing data - which allows for coverage of large areas - and local unmanned data collection devices. Both prove very useful in monitoring large, remote areas such as Nunavik. At the end of this monitoring programme we should have a better idea of what strategies are best for monitoring and managing vast, remote territories such as Nunavik. This is especially important now that the Government of Canada transferred the ownership of over 7,000 islands to the Inuit of Nunavik, which by default fall under the stewardship of the Makivik Corporation. 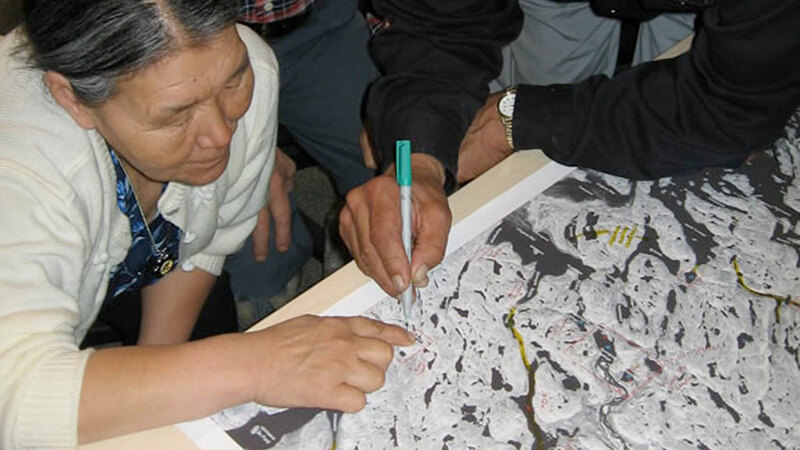 With climate change altering the environment that the Inuit of Nunavik live in, these new adaptive strategies - which make use of both traditional and high-tech approaches to monitor and manage vast territories - will prove highly useful and even irreplaceable. Do you plan to continue the monitoring programme for a longer period of time? If the Polar View programme continues (it has been receiving funding under the European Space Agency's GMES Programme), we plan to continue the monitoring programme after this current season and will hopefully be able to make it a sustainable service for more than just the two current communities that will benefit from it. Adam obtained his BES in Geography from the University of Waterloo with specializations in Geomatics and Biophysical Systems. He works for the Makivik Corporation in Kuujjuaq, Quebec and worked on numerous projects since. In July 2006, Adam and his fiancée Sheila opened Qaujimautik Systems Inc., an Inuit owned company that provides remote tracking and emergency alert equipment.